For many people, the holidays are a chance to relax and catch up on some reading, or to reflect on how to make their life better. The latest crop of business books helps you accomplish both. Advances in technology were supposed to afford us more time and flexibility, but many of us still find ourselves struggling to balance work, family, and most of all, our own personal fulfillment. Focal Point helps the overwhelmed and frustrated with its “Grand SLAM” formula: “Simplify” your life, “Leverage” other people, “Accelerate” your work, and “Multiply” your accomplishments. Have you ever wondered why some people (maybe even you) have all the skills and experience they need to succeed, but never seem to get to the next level? Chances are, these people are demonstrating one or more of the behaviors described by Waldroop and Butler, directors of MBA Career Development at Harvard Business School. They identify and detail critical errors, such as feeling inadequate, avoiding conflict, doing too much, and pushing too hard. “Most people learn their greatest lessons not from their successes but from their mistakes,” says Waldroop. Fortunately, the authors also offer insight and advice on how to break and learn from these self-defeating habits. We’ve all heard Bill Gates and Donald Trump trumpet their thoughts on business. But did you know that Saturn, Southwest Airlines, and Hewlett-Packard are led by women? 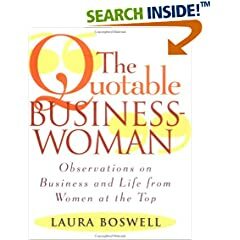 This book’s advice comes from the best and brightest of American businesswomen today. Successful female executives, from Hewlett-Packard CEO Carly Fiorina to Avon head Andrea Jung to homemaking maven Martha Stewart, dish quotes and anecdotes about reaching goals, taking risks, and winning in the world of business–and life. Makes a great gift for female co-workers or clients, as well as your college-senior daughter or an entrepreneurial sister. When Mary Foley began her $8-an-hour job at tiny Quantum Computer Services a decade ago, little did she know that the company would one day become media behemoth AOL, or that she would eventually become its first head of corporate training, or that she would retire a millionaire at age 33 as a result. 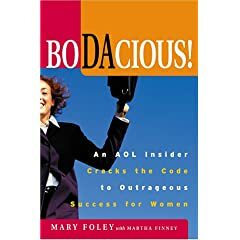 Now Foley shares her insight into how to transform your life by being bold and audacious–bodacious! “Those characteristics of AOL that made it the huge success story it is today were the same qualities I needed to achieve to fulfill my own potential,” says Foley. Her practical tips (Create a personal business plan; Surround yourself with upbeat, resourceful friends; Office politics aren’t pretty, but they are a good thing) help guide you. Learn to live your life the “Bodacious Way” and become a new, fulfilled you. 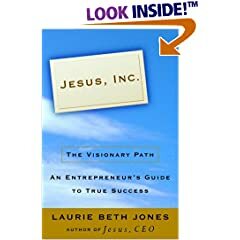 Following up her best-selling Jesus, CEO, Laurie Beth Jones examines the hunger for meaning and spirituality among people who once pursued their careers solely for money and prestige. Whether they worked independently or for companies, millions of Americans are now trying to use their talents to benefit the world as well as themselves. Jones calls these people “spiritpreneurs” because they fully bring their souls into their workplaces. She also uses the story of Jesus as an example of the ultimate spiritpreneur, as well as the stories of other biblical figures and their successes and failures. Jesus, Inc., however, is not just for Christians, but for anyone who believes it’s possible to do well by doing good and wants to learn how to start. Perhaps the events of September 11 have stirred your spirit for volunteering, or maybe you regret never following through with your post-college dream of international travel. If so, you should check out this book. Every year, more than 100,000 people contact the Peace Corps about volunteering, but only 3,000 can be placed overseas. To help these and other Americans find the volunteer opportunities that are right for them, Collins, DeZerega, and Heckscher–all founders of respected international organizations–have produced this guide. They profile over 100 organizations, discuss short-, medium-, and long-term opportunities, and offer advice on safety and fundraising. This is an indispensable guide for anyone who’s ever dreamed of living and volunteering abroad.